Excerpt from Columbian nursery rhyme: "Watch where you step! Don't say a word! You'll be in trou-ble if the boys have heard!" Experimented upon since youth and sealed away from sight behind masks of copper, the Boys of Silence rank among the most bizarre and fearsome inhabitants of Columbia. Uniquely sensitive to both sound and motion, the Boys of Silence are capable of detecting all but the stealthiest of intruders. How will you fare if one is near? After the Big Daddies and Splicers and whatnot from the first two games, we're running a bit light on the villains for Infinite. 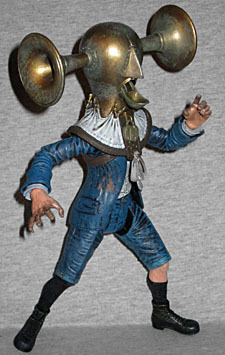 Granted, the main baddy - the Songbird - is far too huge to be made into a full-scale figure, but we can't get a big Handyman? 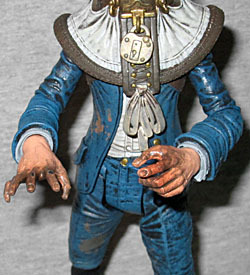 NECA hasn't completely left us hanging though. The Boys of Silence were originally meant to have a larger role in the game - sort of like free-roaming security monitors, tracking you around the levels and calling for backup when they found you. They were also going to collect sound, storing it up before throwing it back you; so if you used noisy weapons around them, they would attack you faster and more powerfully. That had to be dropped when players couldn't figure out why they were being attacked, or what the sudden lack of any and all ambient noise meant. The idea behind the Boys is that they're chosen when young, and sealed into their helmets. To that end, they wear clothes that look like schoolboy uniforms, but the sleeves and pantlegs are too short. One of his socks has fallen down, exposing a little bit of shin, and his shirt is partially untucked. His hands look huge - like, "Mezco Reservoir Dogs" huge. 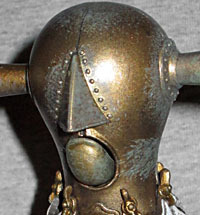 The mask does look like cast metal with a nose riveted on, and there are large wingnuts around the neck that hold up some sort of cloth bunting. Laces run up the front of the breastbone, and there is a free-swinging lock at the throat. The Boy was sculpted by Alex Heinke, who's also done things like Gordon Freeman and Duke Nukem. 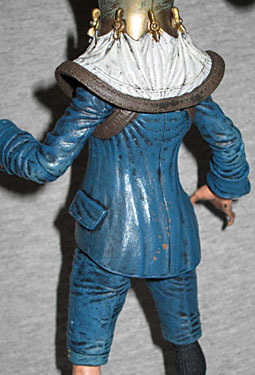 The paint also does its part to make the Boy of Silence look like he's been living in these clothes for way too long. The whites of his shirt and neck-frill are a dingy color, there are splotches of mud on his jacket, and his fingers are so caked with grime that they're nearly black. The tone of his helmet is variegated, just like real metal would be - there are spots and imperfections like you'd find on tarnished metal, though this looks more like brass than copper. Articulation is good. The BoS moves at the shoes, knees, hips, waist, wrists, elbows, shoulders, and neck. The ankles are just swivels, for balance, but the torso, head and (most surprisingly) the hands are all on balljoints. Nice! Everything else is a swivel/hinge combo, so the toy moves very well. There's also a bit of an action feature, in that when you turn the "ears" back, it makes his jaw move. It's not a complex feature, but it's fun and it works well. Back when the Boys would have stored up sound and thrown it back at you, their mouths would have opened like a thing that goes doink; this gimmick is a nice nod to that. 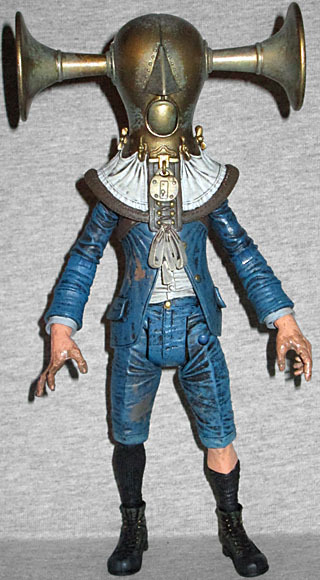 Actually, between the action feature and... well, the fact they made him at all, you get the feeling that NECA was working off Irrational Games' old plans for the Boy of Silence, rather than the finished product. In the game, the Boys just show up once, and are pretty lame when they do. Scary, but lame. (Example: if they're based on sound, why do you have to hide from a light that's inexplicably coming out of their [closed] mouth? The original concept was better.) This toy is really well made, though; it's like an artifact ripped from an alternate reality, where the Boys of Silence were the awesome threat they should have been. *Note: not a real mashup. Yet. Make it and we'll link to you.